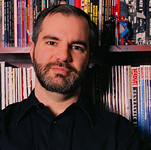 Raised on a steady diet of fantasy novels, comic books, and Dungeons & Dragons, Peter V. Brett (“Peat” to his friends) has been writing fantasy stories for as long as he can remember. He received a Bachelor of Arts degree in English Literature and Art History from the University at Buffalo in 1995, and then squandered over a decade in pharmaceutical publishing before returning to his bliss. He also enjoys comics and role playing. He lives in Brooklyn with his wife Danielle and two cats, Jinx and Max Powers. Learn more about him and his novels at Peter V. Brett’s website. 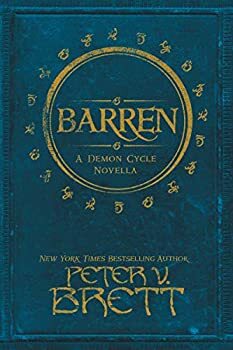 Barren (2018) is a novella-length (just over 130 pages in my ARC version) story that answers some questions left after the conclusion of Peter V. Brett’s DEMON CYCLE series. Specifically, what happened back at Tibbet’s Brook, the small village that was home to Arlen Bales and Renna Tanner, two of the protagonists of the Cycle. I’ve often said that employing the usual fantasy tropes in a novel isn’t an automatic sign of poor writing; it’s what you do with them that matters. Witness the three main characters in Peter Brett’s The Warded Man: a young boy leaving his small hamlet for the larger world, a young girl trying to maintain her independent nature, a young orphan who must make his own way in the world. Anyone seen these before? Anyone? Buehler? Luckily for us readers, however, Peter Brett does in fact know what to do with them, sharpening the standard character types with a depth of characterization that makes us care about what happens to them, and setting them in an original, often tense, plot. The Desert Spear is Peter Brett’s very worthy follow-up to his excellent first novel, The Warded Man. 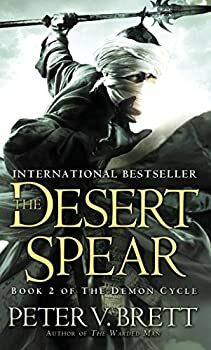 The Desert Spear may not be quite as consistently good as The Warded Man, but it remains a strong book in its own right, more than avoiding the pitfalls of that dreaded second novel curse. 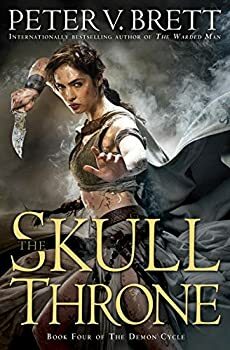 I’ve been thoroughly enjoying Peter Brett’s DEMON CYCLE series from the beginning, and the most recent addition, The Skull Throne, continues to impress, even as it sidelines two of its major characters for the vast majority of the book. 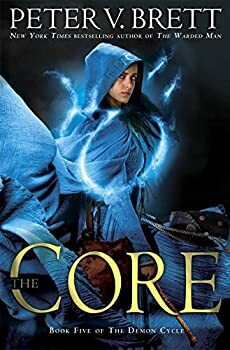 Fair warning, the review can’t help but offer up some spoilers for prior novels, especially the last one, which ended literally on a cliffhanger. 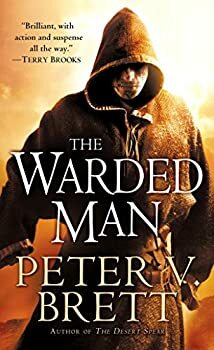 Shame on me for not having read Peter V. Brett’s The Warded Man and The Desert Spear yet. 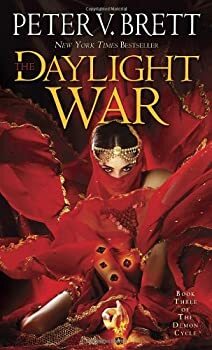 I have them on audio and I look forward to reading them — I just keep thinking that I’ll let Mr. Brett get further along in the series before I jump in (the series has been progressing slowly, but book 3, The Daylight War, comes out next February). 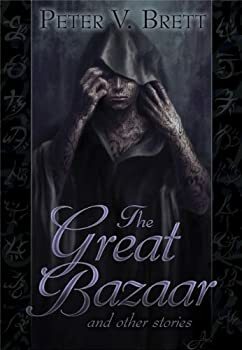 Yet I’m attracted to Brett’s world and after reading his novella Brayan’s Gold, I wanted more, so I picked up the audio version of The Great Bazaar, another novella set in this land that’s overrun by various types of demons every time it gets dark. I’m really enjoying these little novellas that Sub Press puts out. 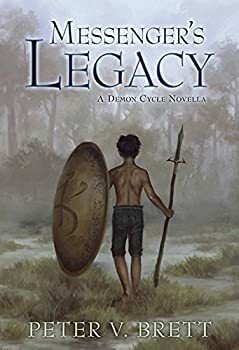 Because they’re meant as stand-alone side-stories, they’re a great way for me to get a feel for an author’s world and writing style before jumping into a big series. 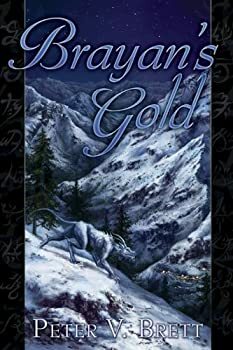 Peter V. Brett’s Brayan’s Gold is the story of how Arlen, one of the main characters in Brett’s Demon Cycle, goes on his first solo job and meets a snow demon. The episode is referred to in the story collection The Great Bazaar, but hadn’t been written until Brett’s friend asked him about the story. So, here it is.